"Our tricky Little Minx Coat -- a cleverly conceived fashion to wear with pride. Wear it casually flared -- or as a wrap-up with a big jewel to hold it snugly to you. Any which way you prefer, it will enhance that very special occasion." 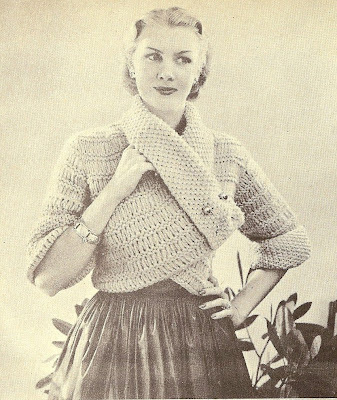 It's from Smart Knitting, 14th Edition, 1954, and while it wouldn't be authentic, I could see this in a Colinette yarn. Two pages of instructions start here. What an interesting sweater. I so enjoy your blog, especially the stories about your "critters". As the "staff" for 3 cats, I understand and sympathize. That woman totally knows something we don't. Look at her eyes. I was discussing with a friend the other day that our country has lost the art of dressing well. He made reference to an old Bette Davis movie, and he told me that the glamor was evident throughout. 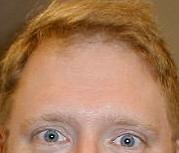 Your blog really evokes that time. Our country has lost the art of dressing, period. Clever! I really like that. You could also do it in a kind of tweedy wool--I think it would make an interesting outdoor sweater for fall or spring. Funny, my sister and I were talking about the lost art of dressing well just last week. Very cute! And check out that model! She's totally a minx! Has anyone else had a problem downloading this pattern? I tried the size Large and couldn't get to page 2 of the instructions. Have never heard of "Corel" and was unable to work with it. 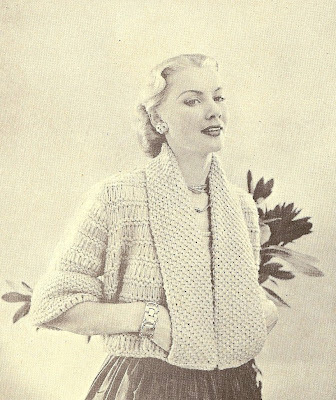 Any help would be much appreciated, as this is such a great pattern and that model is "Grace Kelly's twin!" James, if you are unable to download the jpegs from Flickr please contact me at blueprairie(at)yahoo.com. I will send you a copy via email and we'll see if that works. This coat is a corker and yes, that model is something else also! I don't understand how to start it. Row 1 is very confusing. Well I suppose what I'm really asking is how many stitches to cast on row 1. Caiti, vintage patterns can be tricky. Have you tried knitting a swatch in the pattern? I don't make most of the patterns I post, I'm afraid, I just put them online to share. Is there anyone out there from Manchester?